Service Availabilities in Pittsford, Fairport, Greece, Webster & Rochester New York (NY) Areas Near Me! 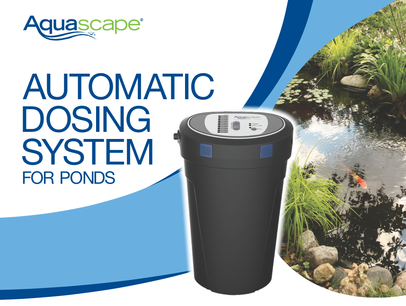 Adding beneficial bacteria to your Rochester New York (NY) koi fish pond, fountain or water feature is made easy with Aquascape's NEW beneficial bacteria Automatic Dosing System. Do you have a water garden or pond that is experiencing string algae issues or water clarity problems? Have you ever forgotten to add your water treatments to your backyard pond only to be reminded by an abundance of algae growth? The Aquascape Automatic Dosing System will help keep your water feature looking great all year long! In order for treatments to work correctly, or to maintain optimum water quality, water treatments should be added consistently and on a regular basis. 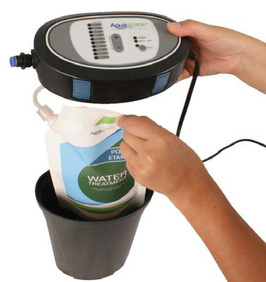 The Aquascape Automatic Dosing System helps by accurately and consistently adding your choice of water treatment. Pond size indication - Quickly and easily dial in the correct amount of water treatment based on pond size. 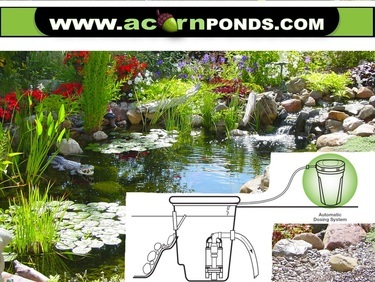 Increase/decrease pond size - Simple adjustment for increasing or decreasing pond size. X2 dosing selected for new ponds and spring startup - Ideal for new ponds, problem ponds or after large water changes or pond cleanings. ﻿Replace water treatment indicator ﻿- When the water treatment needs to be replaced, the refill bag indicated light located on the control panel will flash, simply replace the water treatment and the unit will continue to dose based on your last setting. Aquascape Clean - Reduces organic waste caused by fish waste, uneaten fish food, leaves and debris that fall into the pond. Keeping ponds free from organic debris helps optimize water clarity and quality. Aquascape Clean contains a powerful combination of sludge eating bacteria and enzymes. Aquascape Clear - Controlling water quality can be difficult and possibly harmful to fish and plants if done incorrectly. 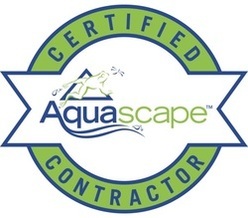 Aquascape Clear can now be added to the pond slowly and consistently reducing issues caused when shock treating the pond with a single treatment. Aquascape Protect - Is made from natural plant extracts chosen for their natural healing properties that will reduce fish stress, prevent parasites and bacterial infections. Reduce Pond Maintenance in Fairport NY. Get a healthy Pond, in Fairport NY sign up now! Fall Pond Maintenance? We are your best choice in Fairport, Monroe County, NY. "They really know everything about ponds from building to maintaining to cleaning them. Would definitely recommend."